International Journal of Human Capital in Urban Management (IJHCUM) accepts submission via its online submission system. The submitted manuscript must be accompanied with a cover letter in which the authors should state why the manuscript should be considered, evaluate on any issues relating to the IJHCUM editorial policies and declare if they have any competing interests. The authors of received manuscripts are also asked to submit a copyright declaration of competing interests as part of their manuscript. 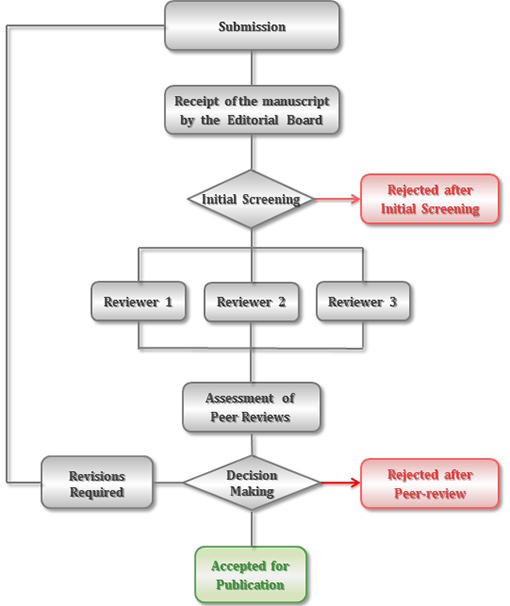 Article submitted to the Journal is sent out to peer-reviewers, although submissions that are out of scope for the Journal or are of an unacceptably low standard may be rejected without review. Potentially suitable manuscripts will generally be reviewed by three experts in the field with the aim of reaching a first decision as soon as possible. Specialist statistical advisers are used when necessary to ensure that the statistical reasoning in manuscripts is sound. Reviewers are asked to declare their competing interests, if any. This cycle continues until final acceptance or rejection.